Miguel Penabella always tears up to Sufjan Stevens. When I wrote about Life is Strange two years ago, I praised its use of music for underlining a clear sense of place and for welcoming players to consider protagonist Max Caulfield’s contemplative inner world. Syd Matters’s wistful “To All of You” imagines the world as sad without “all of you American girls,” reflecting Max’s grief as she cheats death out of claiming the life of childhood friend Chloe Price even as all signs point to the inevitability of her death. Later in the game, the Bright Eyes song “Lua” pairs with a scene in which the characters enjoy a silent moment together, conveying the melancholy mood of the game and reinforcing central themes of togetherness, grief, and loneliness. 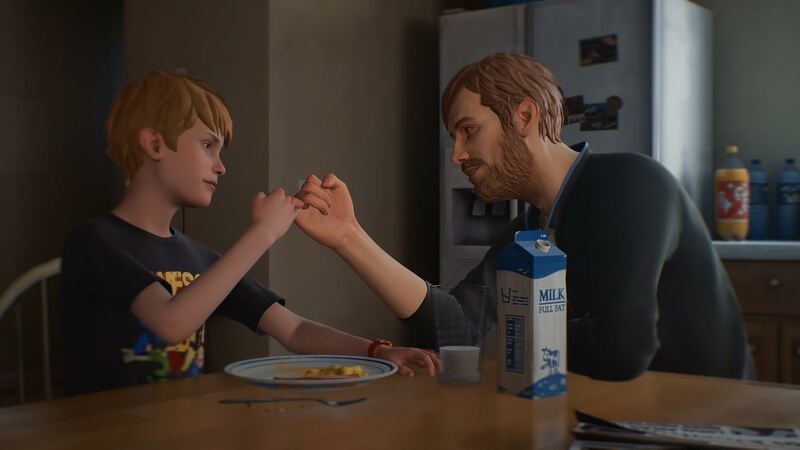 The Awesome Adventures of Captain Spirit, a short prelude to Life is Strange’s sequel, follows the same strategy of centralizing pensive, acoustic indie tracks to aid in our processing of complex character emotions and to create spaces for characters to reflect themselves. In particular, the game takes Sufjan Stevens’s “Death with Dignity” as its primary musical accompaniment, opening the game and recurring as a somber leitmotif. The song originates from the 2015 album Carrie & Lowell, a deeply autobiographical work about Stevens grappling with the death of his mother and the fraught relationship they had. Its lyrics are tender and candid, and Stevens’s performance is tinged with resentment, confusion, shame, and ultimately forgiveness. Likewise, Captain Spirit addresses how children process complex emotions like grief following the loss of a parent. Both Carrie & Lowell and Captain Spirit take place in Oregon, with the former attempting to recapture the hazy memories of warm summers when Stevens’s mother was still a presence during his early childhood, and the latter quietly unwinding over the course of a wintry morning as the young boy Chris, alongside his sullen father Charles, grapples with the death of his mother Emily. The wide-eyed and blond-haired Chris—a spitting image for the young Stevens photographed in the liner notes of Carrie & Lowell—finds his childhood innocence strained as he uncovers small signs of despair in his father even as Charles himself conceals these woes through reassurances and sad smiles: a hidden letter detailing missed mortgage payments, a flyer from an alcoholics support group, a fist mark embedded in a wooden door. 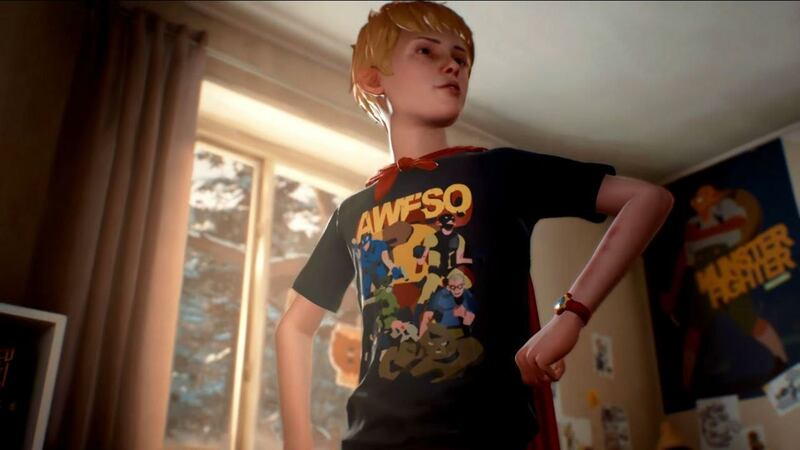 Even as Chris dons a makeshift superhero outfit as Captain Spirit, a character of his own invention, he finds no grand lifesaving objectives in the game. Instead, the game is centered on mundane acts of self-care, suggesting that the accomplishment of such menial tasks as taking out the trash or microwaving breakfast are acts of great heroism when under the kind of emotional duress these characters find themselves in following the death of Emily. While the grieving Charles distracts himself by yelling at the game on television and drinking beer in the morning, Chris deals with his grief by turning to his lively imagination. Mourning and loss may be too difficult to straightforwardly process for a child, and in Captain Spirit, it comes through via metaphor and fantasy. Chris’s fears and anxieties are visualized during acts of play as the imagined superhero. Strewn beer cans indicative of Charles’s alcoholism turn into props for Chris’s snowball target practice; a lonely dark room becomes a monstrous villain to defeat. Chris feels that he’s utterly alone, but finds courage to continue when roleplaying as Captain Spirit, lending him the necessary confidence. That his alter ego is named Spirit is no coincidence, as spirits recur throughout the game. Stevens’s lyrics introduce the motif in the game’s opening, where he welcomes us in a near-whisper over delicate acoustic picking, “Spirit of my silence, I can hear you, but I’m afraid to be near you, and I don’t know where to begin.” Stevens’s wistful reflections and regrets over the troubled relationship he had with his mother find parallels with the game’s exploration of a child’s uncertainty of dealing with death and Chris’s developing emotional maturity amidst loss. Throughout the album, Stevens still feels the presence of his late mother as he grieves, singing, “Your apparition passes through me in the willows,” and likewise, the spirit of Emily lingers in the scattered objects throughout the game. She’s invoked in the perfume bottle that Charles keeps as a memento in his bedroom; she’s remembered when Chris lies in her bed, listening to the vinyl records she once owned. While we see Stevens’s mother and her dark hair and oversized glasses on the cover of Carrie & Lowell, Emily is never visualized in Captain Spirit. Instead, her presence remains ghostly, a corporeal absence in which we sense the repercussions of her passing. The lyric “I’m afraid to be near you” doubles as a reminder of the strained father-son relationship of Charles and Chris, as the former’s self-medication through alcohol clouds his ability to be a healthy and affectionate father. In one moment, Charles half-apologizes about bruises on Chris’s arm, and later, in a moment of anguish, he blames his son for his mother’s death. But because the game is filtered through the perspective of a child, we lack the full picture of the family situation, receiving only glimpses. A concerned neighbor, letters from school, and other such interventions to repair a broken down family hint at a broader network of support that nevertheless fails to materialize in a home that desperately needs it. Instead, Chris and Charles must process Emily’s death in their own individual ways, silently and separately grieving. Later in the game, “Death with Dignity” returns on the soundtrack when Chris sits in his treehouse outside, wordlessly overlooking his backyard. Images of fresh snowfall on the ground, smoke rising from a chimney, branches reaching for the sky, and the sunrise peeking through the leaves accompany the tender instrumentation and contemplative lyrics of Sufjan Stevens, and the moment is quiet, understated, and beautiful. As Chris sits and watches his breath in the cold, the silence makes us wonder, what is he thinking about in this moment? This pause in action invites us to consider the inner lives of its characters, and we’re left to ponder if Chris is thinking about his mother as he gazes skyward, or the letter from school about problems with other classmates that he still hasn’t shown his father, or his friends who now live far away. While we don’t have full access to the thoughts of Chris in this moment, Stevens’s lyrics fill in the gap. Carrie & Lowell is about specific people and a specific place, namely, the singer’s mother Carrie and stepfather Lowell Brams, as well as memories of his childhood in Oregon. The lyrical content covers the difficult relationship he had with his mother, who suffered from depression, schizophrenia, and substance abuse, and according to the songs, ultimately abandoned the family. Tracks like “Should Have Known Better” paint a harrowing picture of neglect, as Stevens recalls, “When I was three, three, maybe four, she left us at that video store.” But while such abuses may foster bitterness or resent, Stevens reflects on his relationship as a way to find graceful closure and come to terms with her actions. There’s regret in the lyrics, a yearning to have been closer to the distant parent after her death. “I should have wrote a letter,” he sings, “And grieve what I happen to grieve.” By revisiting childhood memories of summers with both parents in Oregon, Stevens recaptures a more stable period in his life and chooses to remember her in terms of these fond experiences. Songs throughout the album are often sung in hushed tones, as though disclosing a secret to the listener he doesn’t want anyone else to hear. When his voice breaks into a falsetto, we’re made to feel his sorrow as his vocal cords crack under the emotional weight. Like the scenes throughout Captain Spirit where the game slows down and we simply sit with Chris in moments of silent pause, Carrie & Lowell invites us to empathize and share in the emotional toll. We find Chris in moments of daydream and play, but the lyrics gesture to more complex emotions at a formative point in his life as he quietly grapples with loss. While full recovery remains far away in both Captain Spirit and Carrie & Lowell, both works offer glimpses of hope via a recognition of the wonders and joys that surround their central figures. Stevens, for instance, zeroes in on fine details like “light struck from the lemon tree” in the song “Eugene,” or “sea lion caves in the dark” in the song “The Only Thing,” finding slight reprieve from sorrow by acknowledging the sublimity of Oregon’s natural world. In the mundane, hushed scenes of Captain Spirit where Chris finds himself alone gazing at the frozen still life of his backyard or the peeling wallpaper of his mother’s bedroom, he seems at peace as well, even if only for a moment. By slowing down the game and letting the Sufjan Stevens track play over images of tranquility, the game invites us to stop and listen: to the song, to nature, to the quietude of simply breathing.